MOSCOW (Sputnik) - Silvio Berlusconi, the former Italian prime minister, who heads the Forza Italia party, which is part of the center-right coalition, said on Tuesday that he will remain the "director" of the coalition, which hopes to receive the mandate to form the new government after the latest election results. "Our coalition has become the first political force and it should be decisive for the formation of a new government. Now the head of state must take a decision, and we rely on his equability and wisdom, and I am sure that thanks to the center-right coalition and the central role of Forza Italia we will give this country specific answers," Berlusconi said in a video address to Italian President Sergio Mattarella as quoted by the Il Giornale newspaper. Berlusconi also congratulated other coalition leaders on the election results. "For my part, I confirm that in accordance with the respect to allies and concluded agreements, I remain the leader of Forza Italia and will be the director of the center-right and the guarantor of the unity of the coalition," Berlusconi added. Berlusconi's speech, distributed on Tuesday evening, was the first since the end of Sunday vote. He became the last party leader to comment on its results. Sunday general elections in Italy put the country in a deadlock. None of the political forces gained a majority strong enough to be able to form a government. 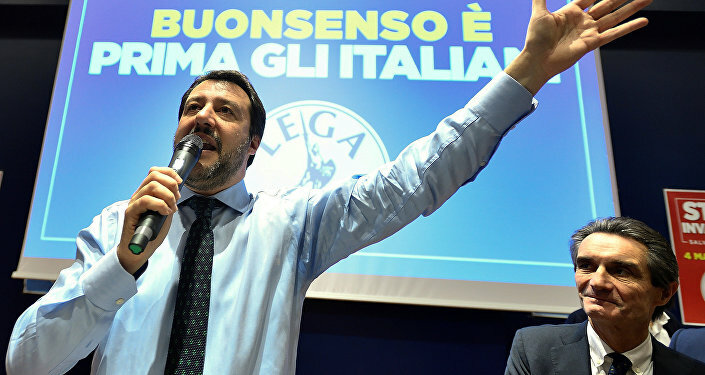 According to the election results, the center-right coalition, consisting of anti-immigrant Eurosceptic Lega (formerly Lega Nord) led by Matteo Salvini, Forza Italia, Brothers of Italy and Us with Italy, won around 37 percent of the vote, while the anti-establishment Five Star Movement (M5S) received around 32 percent. The ruling Democratic Party (PD) won 19 percent of the vote.